Medium opacity with a lighter purple hue. On the nose it screams black currants with some bacon fat and oregano. There is a hint of forest floor at the back end of the nose. 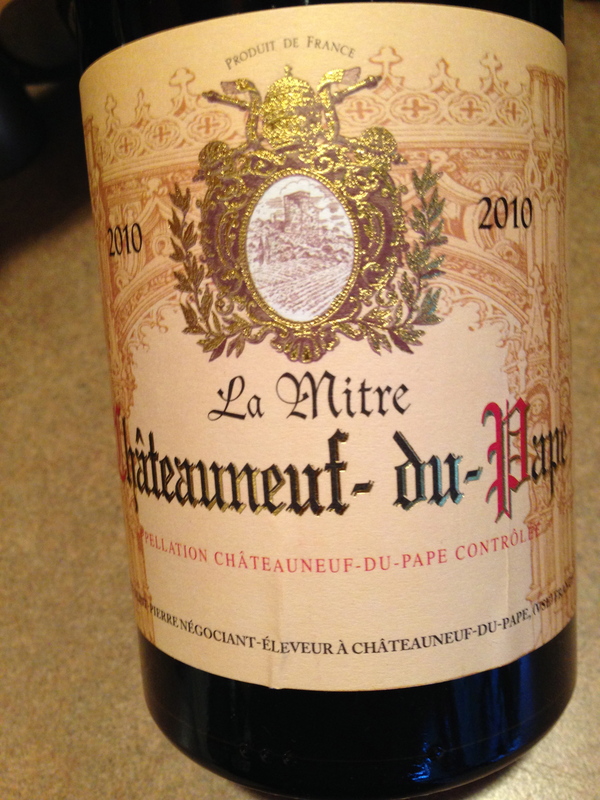 On the palate – berries, medium intensity tannins, tea and olives. The wine transitions nicely to the mid palate with the tannins providing a nice dryness to the mouthfeel. The flavors are consistent through to the finish where I also get some licorice. The balance is nice for a wine that is made for medium term drinking. Perfect for a game dish, even a seasoned Cornish Hen. Drink now till 2033. 91 points and 4 stars for this $34 blend of mainly Grenache mixed with Syrah and Mouvedre. Salut…. I wrote about La Mitre three years ago and recommended giving it a 2-3 year cellaring. I opened one up the other night and here is what I had to say about this offering that is now selling for $30. A lighter purple that is somewhat opaque. Interesting nose of game, plum, rhubarb and an earthiness. On the palate it reveals some astringent tannins that are prominent yet dissipate to reveal cherry, garrigue and cola. There’s a certain imbalance between the tannins, fruit and acidity that I can’t my head around. This wine is 6 years old and needs a little more time. 88 points from me and 3 stars. I plan on re-tasting in a year or two. Salut…. At least once a year my childhood friend comes over for dinner. We will nickname him Rashad. He has good taste in wine and a better sense to ask for help at the wineshop. Last year he brought this beauty along for dinner but I felt it needed time. I cellared it for a year, cracking it open when he came over the other day. I had charcoal grilled a boneless leg of lamb, which was a near perfect companion to this wine. That is correct, I chose the wine and then the meal to accompany it! Nose of garrigue with some plum torte and a hint of oak. On the palate- purple fruits, blueberry jam, licorice and fresh tannins. A solid amount of acidity balances the backbone and gives it a freshness. There’s a long mid palate to this wine that carries the fruit all the way to the finish with a hint of pepper, some game and cherry . The ending is long with plum, tannins and some juiciness. 92 points is my vote. WS gave it 93, RP-91. I think it is at peak and will drink well for another 5 years minimum. It can be found for around $50. A great bottle of mainly Grenache for a big meaty meal! 4 stars from me. Salut…. 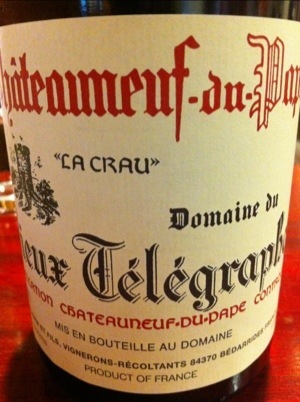 In 1999 we moved to England, where I started to ‘collect’ wines, and had my first CDP. I always think of this region as unique, rich, rewarding and expensive. Inflation has not been kind to the consumers of Châteauneuf, it’s prices going higher and higher by the vintage as the region gains accolades from ‘The Big Man’ which adds dollars to the entry fee, (mind you the quality is also coming up). The region was named after the Pope’s New Castle, and allows seven grapes to be blended with the main Grenache varietal. Think Cinsault, Mourvedre, Syrah and more. Makes my mouth water just listing them. Back to the wine at hand. Dark purple in the glass and a nose of blackberry meets rock. Yup, rock. This wine has a minerality that took a while to pick up. The palate comes across as young, yet ready to play… with Blackcurrants, stone and a green pepper component. Very smooth tannins are built for aging yet are allowing drinkability right now if you decant/aerate (which I did). The structure of this wine is really good, with acidity balancing the alcohol, which alarmed me initially. This particular wine is running at 15%. It’s main backbone coming from 80% Grenache with 18% Syrah smoothing it out and 2% Mourvedre which no doubt adds the tannic and alcohol components. The minerality and stone notes no doubt coming from the terroir, which consists of galettes or round stones. These galettes help maintain the day’s heat and help mold the flavors of the wines and give them that uniqueness. 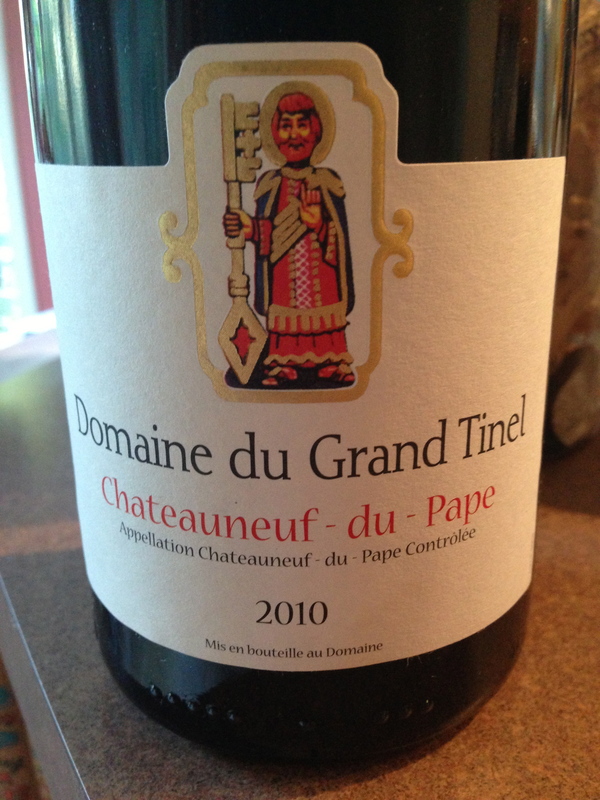 For about $32, you are getting a lower priced CDP that drinks well, has good cellaring potential and is a good introduction into the region if you have never forayed there. 91 points and 4 stars. Salut…. A complete mix of grape varietals, this is a big hitter from the Rhone. A stewed fruit nose gives way to the most amazing floral hit on the palate. Oh, a 45 second finish to boot. The complexity of this wine is amazing, yet the fruit is somewhat subdued. I’m stumped, so much so that they are checking the bottle. I’m waiting, patiently….. I so want this wine to rock my world, and so far- flowers. Apparently the bottle is fine, just a little closed on the nose- Vinturi to the rescue and bingo…. Fig and earth come to mind, with black currants and rose mixing it up with the gentle tannins. I’m not sure how much collaring potential this wine has, but I think it’s a little young and could use another three years in the bunker before you pop a bottle. The hard part—— 92 points and …… 4 Stars. I just can’t see 5 on this one for some reason. A very well made wine, but just doesn’t have what I need to push it over the hump.